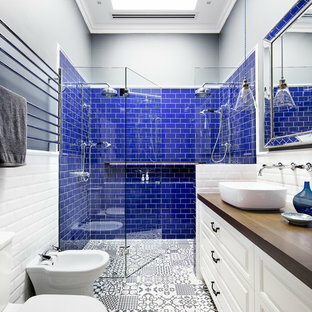 This is an example of a transitional 3/4 bathroom in Melbourne with raised-panel cabinets, white cabinets, a double shower, a two-piece toilet, blue tile, white tile, black walls, ceramic floors, a vessel sink and wood benchtops. Design ideas for a mid-sized transitional hallway in Sydney with white walls and medium hardwood floors. 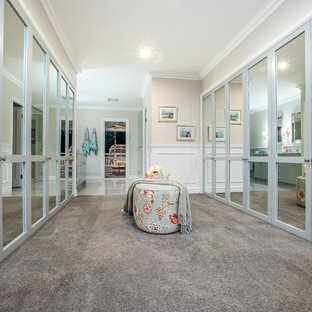 Photo of a large traditional gender-neutral dressing room in Brisbane with shaker cabinets, blue cabinets, carpet and grey floor. 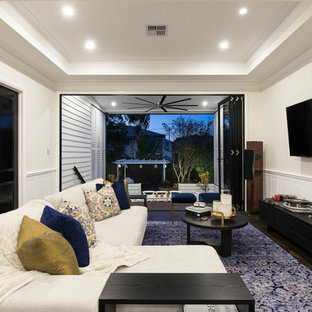 Transitional enclosed family room in Brisbane with white walls, dark hardwood floors and a wall-mounted tv. 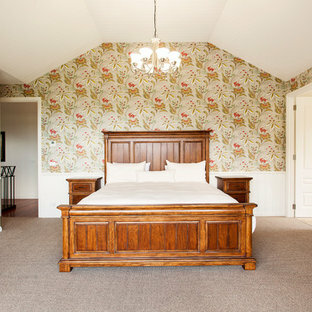 Traditional master bedroom in Melbourne with multi-coloured walls, carpet and brown floor. 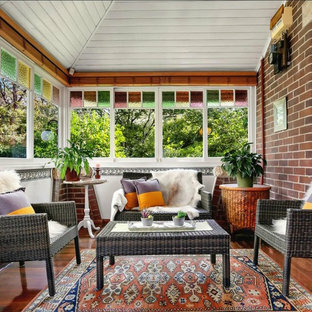 This is an example of a mid-sized traditional sunroom in Sydney with medium hardwood floors, a standard ceiling and brown floor. Inspiration for a mid-sized beach style master bathroom in Gold Coast - Tweed with a freestanding tub, grey walls, shaker cabinets, white cabinets, an open shower, a one-piece toilet, white tile, ceramic tile, ceramic floors, a drop-in sink, engineered quartz benchtops and black floor. 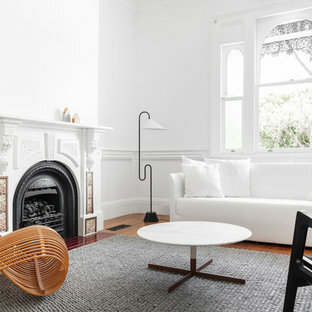 Contemporary formal living room in Sydney with white walls, medium hardwood floors, a standard fireplace, a metal fireplace surround and brown floor. 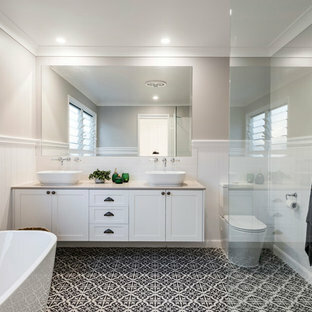 Photo of a traditional powder room in Brisbane with recessed-panel cabinets, white cabinets, a two-piece toilet, mosaic tile floors, an undermount sink and grey floor. Transitional bathroom in Gold Coast - Tweed with shaker cabinets, white cabinets, an alcove tub, a corner shower and white walls. Photo of a large traditional open concept family room in Toronto with a stone fireplace surround, beige walls, medium hardwood floors, a standard fireplace, a wall-mounted tv and brown floor. Transitional separate dining room in Chicago with medium hardwood floors and brown floor. Photo of a small traditional powder room in Ottawa with a wall-mount sink, gray tile, matchstick tile, a two-piece toilet, beige walls and medium hardwood floors. Design ideas for a large traditional living room in Chicago with beige walls and brown floor. Design ideas for a mid-sized transitional formal enclosed living room in Toronto with white walls, dark hardwood floors, a standard fireplace, no tv and a stone fireplace surround. Country bathroom with furniture-like cabinets, medium wood cabinets, grey walls, medium hardwood floors, an undermount sink and brown floor.